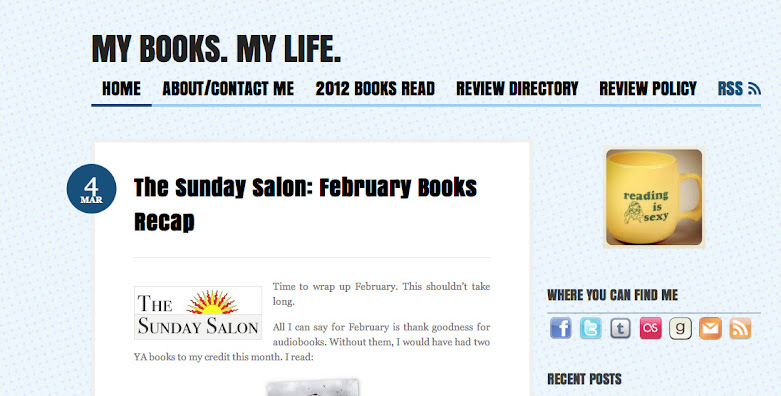 New Look – my books. my life. So yesterday afternoon, I started thinking about changing my blog theme. By the time I went to bed, I’d picked a theme and customized it just a bit, and here we are, not too many hours later, and I’m using the theme. Patience is a virtue which I do not possess. I didn’t promise a good story. When I implemented my old theme, it was after hours and hours of customizing the CSS. This one, with a couple exceptions, is pretty much right out of the box. Maybe that makes me unoriginal. But there are only so many hours in the day and I’d rather not spend very many of them playing with computer code. There are still a few quirks to work out (for example, I can’t figure out how to change the color of hyperlinks within the actual body of a post and I have no idea why it made all of my book covers gigantic). But this is basically it. For now. I am pretty sure this theme was meant for a crafty blogger – a quilter or a sewer – and I am definitely not crafty and have no intention of sewing anything in the near future. But I think it’s cute, so there you go. As my blog has changed over the past year (as I’ve embraced my new role as a new mom and reading isn’t always a priority), I felt like I needed something new. I may shuffle some pages around and add some new ones, but things won’t be changing too much. You can still expect sporadic book reviews mixed in with baby pictures. I like it! Life is a journey, ever changing..go with it. I like it too! It’s very clean and inviting, and I think you made a good choice! I really like it. It seems to fit you more than the last one. I like. It’s still really clean and easy to read. Maybe a bit easier even on the eyes.